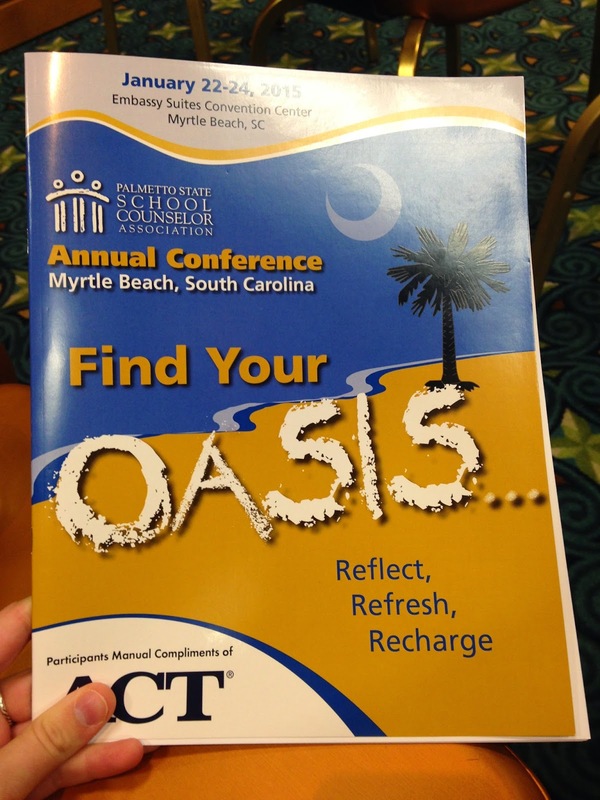 The Palmetto School Counselors Association Annual Conference is underway in Myrtle Beach, SC. This year's theme is "Find Your Oasis," and there are a variety of breakout sessions for elementary, middle, and high school counselors on varying topics such as technology, best practices, professional development, and leadership. There are so many great looking topics to choose from, it's hard to pick just one per session! I will be presenting during the last break out of the day on "21st Century Tech Tools." I will be using a Prezi presentation to teach on the cultural relevancy, efficiency, and effectiveness of technology in school counseling programs. I'm focusing on programming, idea sharing, and data collection with specifics on Remind (formerly Remind101), Pinterest, and Google Drive (to name a few). I'm going to be trying out some new technology with some Slido polls under the hashtag #PSSCATech.